Valve Software invites you to shoot terrorists all weekend long, for the very attractive price of "absolutely free." Can I just take a moment to publicly praise Valve Software for everything it's done with the Steam digital distribution system? It would have been perfectly acceptable for the company to simply create a solid, stable platform upon which users can find almost any game they could possibly desire, but then Valve has to go and sweeten the pot by periodically offering players the chance to test drive major releases for days at a time. This is obviously a lucrative move for the company, but it's also generous. Proper to Valve for that. I kicked things off with that premise as this weekend sees Counter Strike: Global Offensive momentarily joining the ranks of games you can play for no money down. From now until Monday at 10AM Pacific Time, you need only download the Counter Strike: Global Offensive client, then log onto a server to enjoy as much wanton gunplay as you can stomach. Ah, but that's not all. If, during the course of the weekend's bloodshed, you decide that maybe you'd like to keep playing Counter Strike: Global Offensive beyond Monday morning, you're presented an opportune chance to make that a reality. Not only is Valve launch a weekend-long free trial for the game, it's also slashed the title's price by 50 percent. If you act fast, you can own the game outright for a mere $7.50. This promotion also ends on Monday morning. Oh, and if you happen to be one of the three people on the planet unaware of Counter Strike, I'll simply say that it's a team-based multiplayer shooter which pits two sides (terrorists and counter terrorists) against one another in a battle to see who can kill the most dudes, rescue the most hostages, or prevent a bomb from being detonated. 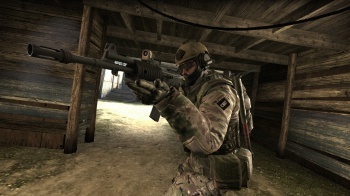 Global Offensive is the latest reworking of the original Counter Strike (one of the most popular fan-created mods of all time), and aside from various gripes about the series' balance changes, it's a pretty solid shooter. I'd convince you of its positive qualities more, but since the game is now available to play totally gratis, that seems unnecessary. All the info you'll need to get started with Counter Strike: Global Offensive can be found on the game's official Steam page, linked below.